In this lesson, Shaykh Faraz highlights the verses 183-186 of Surat al-Baqara, which are the verses on fasting and Ramadan. They correspond to the sixth chapter of Imam Ghazali’s Ihya on fasting. He tells us about the aims of fasting through these verses, and gives some key meanings of those aims and tips on how to attain them. In verse 183 of Surat al-Baqara, Allah tells us that “Believers! Fasting is prescribed for you, as it was prescribed for those before you, so that you may be mindful of God.” (يَا أَيُّهَا الَّذِينَ آمَنُوا كُتِبَ عَلَيْكُمُ الصِّيَامُ كَمَا كُتِبَ عَلَى الَّذِينَ مِن قَبْلِكُمْ لَعَلَّكُمْ تَتَّقُونَ). First, Shaykh Faraz explains the balance and significance of corresponding with the people of book and faith before Islam. He clarifies the difference between corresponding and following, and how correspondence gives a sense of continuity of guidance. Shaykh Faraz then explains the concept of taqwa (mindfulness of Allah). He defines it as guarding oneself from the displeasure of Allah. He then gives some key guidance of how to attain that taqwa. Then in verse 185 of Surat al-Baqara, Allah tells us that “Ramadan is the month that the Quran was revealed as guidance for mankind,clear messages giving guidance and distinguishing between right and wrong…God wants ease for you, not hardship. He wants you to complete the prescribed period and to glorify Him for having guided you, so that you may be thankful.” (شَهْرُ رَمَضَانَ الَّذِي أُنزِلَ فِيهِ الْقُرْآنُ هُدًى لِّلنَّاسِ وَبَيِّنَاتٍ مِّنَ الْهُدَىٰ وَالْفُرْقَانِ… يُرِيدُ اللَّهُ بِكُمُ الْيُسْرَ وَلَا يُرِيدُ بِكُمُ الْعُسْرَ وَلِتُكْمِلُوا الْعِدَّةَ وَلِتُكَبِّرُوا اللَّهَ عَلَىٰ مَا هَدَاكُمْ وَلَعَلَّكُمْ تَشْكُرُونَ). Shaykh Faraz explains that the verses highlight that the significance of the month of Ramadan is that it is the month the Quran was revealed in, and not the month of fasting. He also highlights that it is an opportunity to recognize Divine mercy, ease and have gratitude. Finally, in verse 186 of Surat al-Baqara Allah tells us: “[Prophet], if My servants ask you about Me, I am near. I respond to those who call Me, so let them respond to Me, and believe in Me, so that they may be guided.” (وَإِذَا سَأَلَكَ عِبَادِي عَنِّي فَإِنِّي قَرِيبٌ ۖ أُجِيبُ دَعْوَةَ الدَّاعِ إِذَا دَعَانِ ۖ فَلْيَسْتَجِيبُوا لِي وَلْيُؤْمِنُوا بِي لَعَلَّهُمْ يَرْشُدُونَ). Shaykh Faraz tells us that this verse expresses the reality of Allah’s immediate closeness without mediation, and what that means. He also highlights the saying of one of the early imams of Islam, Imam Sahl al-Tustari, on the first of the stations of closeness to Allah. He says that it is to feel shyness and shame before Allah of how heedless one is, and how little one is putting forth for the sake of Allah. In this series Shaykh Faraz will be looking at points of reflection from key verses in the Quran. 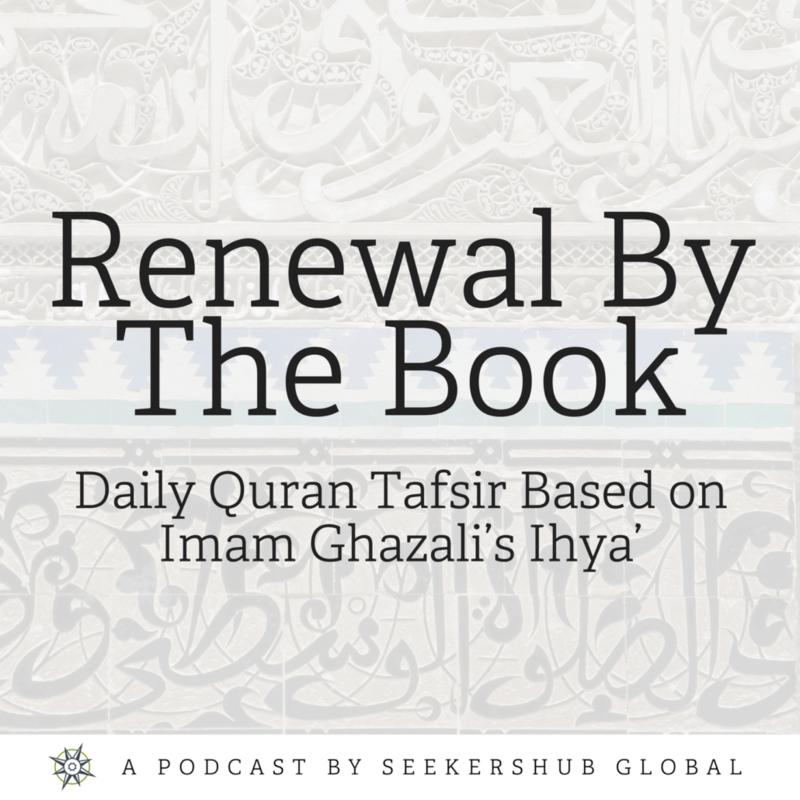 The series will follow the thematic order of Imam Ghazali’s Ihya Ulum al-Din (Renewing the Religious Knowledges). The aim is to connect the key verses of guidance from the Book of Allah with the blueprint of renewal, the Ihya, so that we experience a renewal by The Book.